The East Kilbride Community Trust (EKCT) is appealing to local businesses to get involved in supporting East Kilbride as town on Sunday the 7th February in what will be a historic football match for the town. The EKCT is looking for donations to help them provide a family day out for the disadvantaged families in the community for the EKFC versus Celtic in the 5th round of the Scottish cup. East Kilbride Football club (EKFC) who train at the Trust facility at K-Park Training Academy in Calderglen Country Park have recently created their own history by getting Celtic fc in the 5th Round of the Scottish cup. This is a momentous achievement for the whole town, a real celebration in that the town has won, before it even kicks a ball! The East Kilbride Community Trust are partnering EKFC to arrange to take up to 250 disadvantaged families to the game including transport, match tickets, memorabilia, hats etc. 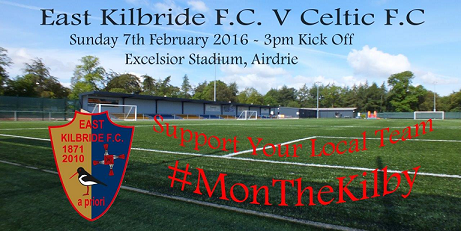 We are appealing to local businesses to get involved in supporting East Kilbride as town on Sunday the 7th February in what will be a historic football match for the town. “We are determined with the local business help to make sure that all the disadvantaged families we look after, have a brilliant family day out, where they will be able to create great memories and feel very much a valued part of the community. “We are looking for donations to help provide this family day out. “Why not sponsor a family for £100 and make their dreams come true?